This is another picture of Thingvellir. Iceland's National Shrine. This is the location of the world oldest extant parliament was established in 930 AD and the modern Republic of Iceland was declared in 1944. I included this picture for two reasons. 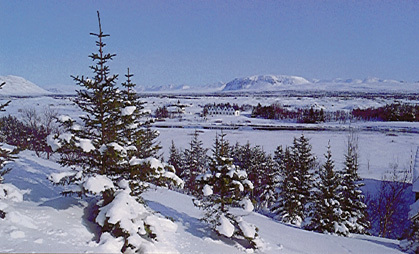 The first is to show the beauty of the Thingvellir area during the Winter months. The second reason was for the unique (at least for Iceland) feature in the picture. If you made it this far look back at the other shots. What was missing in them? Trees! Yes thats right Iceland has very few trees. The reason is the logical one. The early settlers used the wood to keep warm. Now the goverment of Iceland plants many trees. But due to the short growing season they are not very tall. It takes three times as long to grow a tree in Iceland than in the United States or Europe due to this.